This multi-purpose tool window places world time and locations at your fingertips. 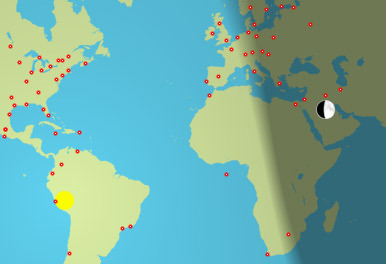 The world map provides a "real time" display of the Sun, Moon, and the areas of sunlight, twilight and darkness. Click on any location to view its current almanac information. Einstime calculates, displays, and updates the information minute-by-minute. Einstime can acquire your current location from a GPS device, plot the latitude and longitude, and provide the current almanac for the Sun and Moon, anywhere in the world.